Get that Police Employee a really nice gift with their details printed onto the case and pen. Ball point pen features elegant proportions. Quality silver plated item. Distinctive clip design. Comes with a replaceable blue ink Parker style refill. Can be engraved free on the chrome case with your message, pen can also be engraved if required with a smaller amount i.e name and date etc. Most days Police Officers are scrambling around the office looking to find a pen for that shift. Without a pen an officer can’t fulfill their duties and on occasions it can be a real pain. So a great way to reward an officer and at the same time help them out, is purchase a pen with their shoulder number engraved! Why not get that someone special a really nice gift which can be used in work! 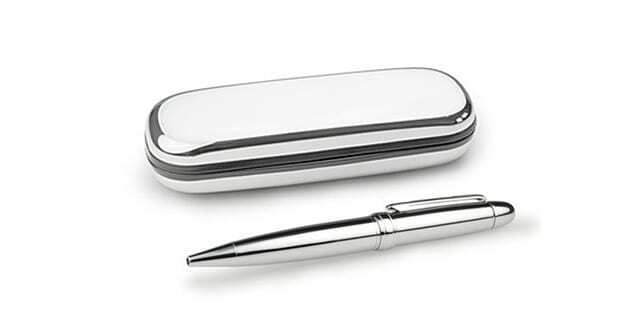 You can get their name and collar number printed on this stylish chrome pen and case. It comes with a blue ink refill, but you can purchase a black ink refill for police use. If you are unsure about the pen, then take a look at the reviews from people who have purchased it over the last 12 months. They are mostly positive reviews and people have commented on the good quality of the pen.